Patrick has 10 years of experience consulting on all aspects of executive compensation strategy and design, as well as governance matters. His particular areas of focus include incentive design, pay-for-performance relationships, tax and accounting implications, and financial goal setting. Patrick co-leads Meridian’s accounting valuation team, serving as a firm-wide resource on valuation models for equity incentives (e.g., Monte Carlo). 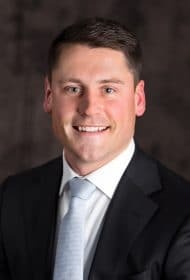 Patrick also assists clients across the firm as part of Meridian’s Performance Measurement Team, which does considerable research and analysis on metric selection, value creation, and goal setting. He has experience working with companies in a variety of industries, including technology, industrial manufacturing, media/advertising, retail, energy, automotive, cryptocurrency, and real estate. His clients range in size from small start-ups to S&P 500 companies. He has also worked with private companies, including those that are financed through private equity. Patrick is a frequent writer and speaker on emerging issues in executive compensation. He has spoken at numerous conferences, including those held by the Corporate Board Member and Equilar.